What is the difference in efficacy between NARCAN® Nasal Spray and naloxone administered by intramuscular injection? What are the considerations regarding ease of use of NARCAN® Nasal Spray? What is the possible impact of nasal passage blockage on efficacy of NARCAN® Nasal Spray? What is the role of fentanyl in chest wall rigidity? The administration of ready-to-use, needle-free concentrated NARCAN® Nasal Spray (containing 4mg of naloxone hydrochloride in low volume of 0.1 mL) results in pharmacokinetic parameters that either equal or exceed those observed following the intramuscular dose of naloxone (0.4 mg) (1). According to a pharmacokinetic study preceding the regulatory approval of NARCAN® Nasal Spray, the maximum plasma concentration obtained after intranasal administration of a naloxone hydrochloride between 2 mg and 8 mg is dose-proportional, exceeds the maximum concentration produced by the 0.4 mg intramuscular dose of naloxone, and is independent of delivery to either one or both nostrils (1). At the earliest time sampled (2.5 minutes), plasma naloxone concentrations after intranasal administration of 2 mg to 8 mg are higher than following the 0.4 mg intramuscular dose which may be advantageous for reversing respiratory depression in opioid overdose (1). There are no differences in the safety profile of NARCAN® Nasal Spray compared to the intramuscular injection of naloxone (1). Deaths from opioid overdose can be prevented through administration of the antagonist naloxone, which has been licensed for injection since the 1970s. The need for a naloxone product for use outside of a controlled medical setting extends beyond the setting of illicit drug use. As the management of chronic pain often relies on the use of chronic opioid treatment, there is risk for overdose for patients and household contacts (2). Over recent years, the off-label use of commercially available naloxone hydrochloride by the intranasal route of administration using a nasal atomizer has been growing in popularity to address the public health problem of overdoses (2). Improvised nasal kits (consisting of a pre-filled naloxone syringe and an atomizer which fits onto the syringe to generate a nasal spray) have been used in different settings (3, 4). These include usage by: ambulance personnel (5-11), emergency departments (12), opioid users, peers, and families in take-home naloxone trials (13–16), and police first responders (17). However, the only published pharmacokinetics study evaluating improvised nasal kits with atomizers in humans found intranasal naloxone (2 mg/5 mL) had a relative bioavailability of only 4% (3, 18, 19), and it is unclear if the pharmacokinetic properties of naloxone produced by these improvised intranasal devices are equivalent to the approved dose of parenterally administered naloxone (1). Improvised devices also require training for effective use, and the recommended volumes (2 to 4 mL) exceed those considered optimum for intranasal administration (1). To support wider availability of naloxone in community settings, novel formulations are being developed, suitable for emergency use by non-medical personnel (3). The first product approved to address the risk of opioid overdose in all settings was Evzio (naloxone auto-injector), approved in 2014 (2). Evzio rapidly delivers a single dose of naloxone via a hand-held auto-injector with audible and written instructions for use and is a prescription treatment that can be used by family members or caregivers to treat a person known or suspected to have had an opioid overdose (2). With the increasing momentum of community-level efforts to increase the distribution and timely availability of take-home naloxone, including intranasal naloxone, in response to the public health crisis of opioid overdose fatalities, there was increasing pressure to develop new intranasal naloxone products for formal approval (20). The U.S. Food and Drug Administration’s requirement was that an approvable intranasal naloxone product must exhibit essentially the same (or better) pharmacokinetic properties compared to the already approved parenteral naloxone product, with evidence of effective usability without prior training (20). A product meeting these criteria can be approved without additional efficacy studies, based on the predictive validity of the required pharmacokinetic profile (20). As a result, NARCAN® Nasal Spray, produced by ADAPT Pharma, Inc., became the first, and so far only nasal naloxone approved in North America. This review describes NARCAN® Nasal Spray and its comparison with intramuscular naloxone. In addition to efficacy of NARCAN® Nasal Spray, this review also addresses the issues of its ease of use, the possible impact of nasal passage blockage on its efficacy, and chest wall rigidity during opioid overdose. 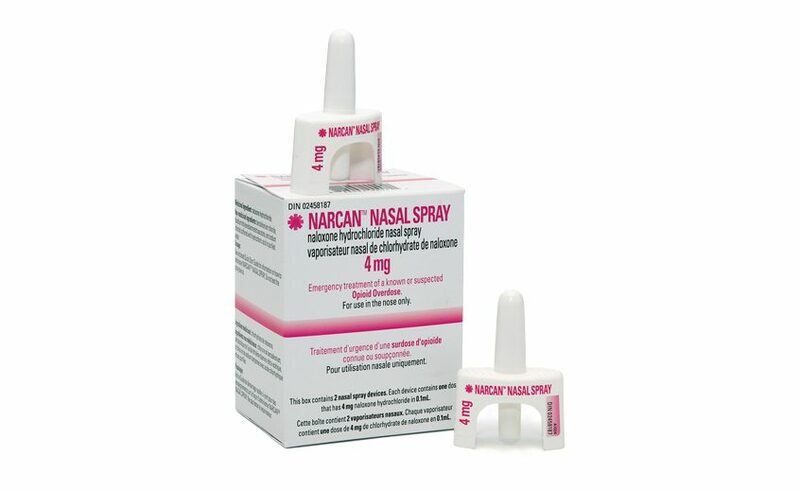 Currently NARCAN® Nasal Spray is the first and only nasal naloxone available in North America for the emergency treatment of a known or suspected opioid overdose (21, 22). The U.S. Food and Drug Administration approved a first nasal naloxone product in November 2015 and Health Canada followed in October 2016 (23). It was granted priority review status upon submission reflecting the public health importance of this product (2). No clinical studies on naloxone hydrochloride nasal spray (device with naloxone) were identified either in this review or in a 2017 review conducted by the Canadian Agency for Drugs and Technologies in Health (CADTH) (24). A pivotal pharmacokinetic study served as the basis for the approval by the US Food and Drug Administration and Health Canada (2, 24). The application for approval relied on a relative bioavailability study in 30 healthy volunteers (1, 2). A single dose of 4 mg naloxone was selected as the formulation for NARCAN® Nasal Spray because it delivers approximately the same amount of drug as 2 mg intramuscular injection, the highest recommended initial dose for treating suspected opioid overdose (1). This pharmacokinetic study was supported in part by the National Institute on Drug Abuse (NIDA) and compared the pharmacokinetic properties of intranasal naloxone (2 to 8 mg) concentrated in low volumes (0.1 to 0.2 mL) to an approved (0.4 mg) intramuscular dose (1). The study design was an inpatient, open-label, randomized, 5-period, 5-treatment, 5-sequence, crossover study (1). Plasma concentrations were detectable within 2.5 minutes after nasal spray and maximum concentration levels of NARCAN® Nasal Spray were achieved as rapidly as with the intramuscular injection of naloxone (1). The 4 mg dose of NARCAN® Nasal Spray provides naloxone concentrations ranging from 3.5-fold to 6-fold higher than a 0.4 mg intramuscular injection (2). The bioavailability of intranasal naloxone is lower than naloxone administered intramuscularly, requiring a higher dose to reach comparable systemic levels (25). Plasma concentrations of naloxone were dose proportional between 2 and 8 mg and independent of whether drug was administered to one or both nostrils (1). The pharmacokinetic properties of naloxone following intranasal administration were similar between male and female subjects (1). There were no differences in the safety profile of NARCAN® Nasal Spray compared to the intramuscular injection of naloxone (1). A recent survey of U.S. community organizations known to have received units of NARCAN® Nasal Spray found that over 70% of the cases reported an observed response within five minutes of NARCAN® Nasal Spray administration (27). This is consistent with the response times reported for intramuscular naloxone formulation; mean time to response with intramuscular naloxone was reported to be six minutes in a randomized study (7). The majority of reported observed events in this survey were consistent with the effects of opioid withdrawal and within the product’s label (28). No new safety issues were identified (27). Each carton of NARCAN® Nasal Spray contains two devices, each unit contains 4 mg naloxone concentrated in a single 0.1 mL spray. In the U.S. NARCAN® Nasal Spray can be accessed at a discounted public interest price of $37.50 per dose ($75 per carton of two devices) by first responders, state and local purchasers, and non-for-profits (20, 26). The wholesaler acquisition cost is $125 per carton containing two devices (equivalent of $62.50 per device) (26). This is by far less expensive than the wholesaler acquisition cost of $3,500 for Evzio (naloxone hydrochloride auto-injector) for each package containing two devices and a training device (20, 26). In Canada, patient or patient’s agent can obtain NARCAN™ Nasal Spray directly from a community pharmacist without a prescription (21). It was announced on March 8, 2018 that in Ontario NARCAN™ Nasal Spray will be available free of charge in pharmacies by the end of March 2018 (27). Other naloxone nasal sprays as non-injectable alternatives are currently being developed and tested. Two of these formulations were tested in small randomized-controlled trials: A 2017 UK study found that concentrated intranasal naloxone doses achieved peak plasma concentrations at 18 minutes (versus 10 minutes by intramuscular injection), and mean bioavailability was around 0.50 (47–51% relative to intramuscular naloxone) (28). A 2017 Norwegian study reported a similar bioavailability (0.52–0.54) and time to maximum concentrations (18 minutes) (29). The Norwegian study reported maximum plasma concentration about half that of the 4-mg dose of NARCAN® nasal spray (29). These studies concluded that an optimized high-concentration/low-volume nasal spray formulation may deliver a therapeutic dose (29), but these findings so far have not resulted in any new product development or regulatory approval. A 2018 review of international patent applications for non-injectable naloxone for opioid overdose reversal found that concentrated intranasal formulations of naloxone (≥10 mg/mL) have bioavailability of 21–42% (relative to intravenous) and 26–57% (relative to intramuscular), with peak concentrations (dose-adjusted Cmax=0.8–1.7 ng/mL) reached in 19–30 minutes (19). Overall, intranasal bioavailability was associated positively with dose and negatively with volume (19). The usability of NARCAN® Nasal Spray by the general public has been supported by a study where the vast majority of study participants were able to successfully perform the most critical steps to administer it, on the basis of the instructions for use without the need for any specialized device training (1). Human factor and usability study on the ease of use of NARCAN® Nasal Spray demonstrated that first responders and laypersons were able to safely and effectively use this product without any prior training (1). Aptar Unit-Dose device (Louveciennes, France) is used in NARCAN® Nasal Spray and human factors studies demonstrated that participants were able to correctly perform the two critical tasks (insert device in nostril and deliver a dose of medication) with a success rate >90%, even when no prior training or guidance was provided (1). This high rate of success is not surprising because the device is intuitive, and has been used effectively in other intranasal products available to the lay public, such as sumatriptan (Imitrex®) for treating migraine headaches (1). In addition, comprehension scores were high for most of the key communication objectives in the patient information section of the package insert, indicating that the labeling is clear (1). A study published in 2018 surveyed U.S. community organizations known to have received units of NARCAN® Nasal Spray regarding their experiences using this formulation (30). NARCAN® Nasal Spray formulation was successful at reversing the effects of opioid overdose in 242 of the 245 cases in which outcomes were reported (30). NARCAN® Nasal Spray was considered non-contributory in two cases (the individuals who overdosed were thought to be already deceased) and no additional information was available regarding the third case of unsuccessful reversal (30). Compared with injectable naloxone products modified to be used off-label for intranasal administration (packaged for layperson use as prefilled syringes along with an atomizer), NARCAN® Nasal Spray does not require training for successful administration, is easier to use and contains a higher dose of naloxone, which is particularly important in light of the increased use of high-potency opioids such as fentanyl (30). Nasal physiologic changes during pathologic conditions, such as polyposis and allergic and vasomotor rhinitis, could theoretically alter the biopharmaceutics of intranasal medications intended for systemic drug administration (31). Physical obstruction of the nasal passage due to prior trauma and subsequent deflection of the passageways is another possibility. Concurrent use of medications with vasoconstriction or vasodilation properties may also affect drug absorption. Increases in mucus production and changes in mucociliary clearance rates could also affect bioavailability (31). A recent study found that obstructive nasal pathology is relatively common in patients who experience serious opioid-induced respiratory depression at about 12%, and it in itself is associated with a higher risk of having opioid-induced respiratory depression (32). Effectiveness of intranasal delivery may be limited in individuals with nasal abnormalities (24) and U.S. Food and Drug Administration listed periodic summary evaluation of airways obstruction among postmarketing risk management activities required from the NARCAN® Nasal Spray manufacturer (2, 25). The only currently available pharmacokinetic study with NARCAN® Nasal Spray excluded participants with either abnormal nasal anatomy or symptoms and those with upper respiratory tract infections (1). Consequently, no relevant literature could be identified on the possible impact of nasal passage blockage on efficacy of NARCAN® Nasal Spray. Chest wall rigidity with opioids was first described in 1953 as “wooden chest syndrome” (33–37). Onset of wooden chest is sudden and produces a rapid inability to ventilate or move the chest wall. The incidence is unknown but this syndrome is rare (33, 36). With the introduction of fentanyl in anesthetic practice in 1981, fentanyl-induced muscle rigidity started to be reported both in adults and children (36). The dose and rate of opioid administration are believed to be risk factors (33). In the peer-reviewed medical literature opioid induced chest wall rigidity has been usually described in case reports of anesthesia complications using fentanyl (33, 34, 36, 37). Acute chest wall rigidity is a well-recognized complication in the medical community but unknown within the drug using community (35) and an average user of illicit opioids may be unaware of the increasing fentanyl content of their illicit opioid purchase and additional risk of death from chest wall rigidity (35). A 2016 study concluded that sudden onset chest wall rigidity may be a significant and previously unreported factor leading to an increased mortality from illicit intravenous fentanyl use (35). Chest wall rigidity may help explain the cause of death in these instances, in contrast to the typical opioid-related overdose deaths. Chest wall rigidity during anesthesia complications is usually reversed by intravenous administration of naloxone (33, 34, 36, 37). No studies have reported on efficacy of NARCAN® Nasal Spray in reversing chest wall rigidity during fentanyl overdose. We searched Medline using a combination of text terms (Narcan or Naloxone) and (nasal or intranasal). In addition, to identify grey literature, Google search was conducted using different combinations of terms Narcan, naloxone, nasal, intranasal. Reference lists of identified articles were also searched. Searches were conducted on March 9, 2018 and results were limited to English articles without date restrictions. The searches yielded 240 references from which 37 were included. Efficacy and effectiveness of improvised nasal kits with atomizers were not the subject of this review and they are referenced for contextual purposes only. No studies identified in this review have evaluated the comparative clinical effectiveness of NARCAN® Nasal Spray versus intramuscular naloxone. Nevertheless, substantial and adequate evidence of safety, efficacy and product quality have been provided to obtain approval by Food and Drug Administration and Health Canada (25). There may be considerations about cost-effectiveness that require further analysis. With Ontario set to be the first jurisdiction to provide NARCAN® Nasal Spray free of charge and prescription-free, further studies and data will provide more details about real-life usability and effectiveness of NARCAN® Nasal Spray. Krieter P, Chiang N, Gyaw S, Skolnick P, Crystal R, Keegan F, et al. Pharmacokinetic properties and human use characteristics of an FDA-approved intranasal naloxone product for the treatment of opioid overdose. Journal of Clinical Pharmacology. 2016;56(10):1243–53. U. S. Food and Drug Administration. Center for Drug Evaluation and Research. Summary review for regulatory action: Narcan nasal spray. Available from: https://www.fda.gov/downloads/Drugs/DevelopmentApprovalProcess/DevelopmentResources/UCM480092.pdf. 2015. Strang J, McDonald R, Alqurshi A, Royall P, Taylor D, Forbes B. Naloxone without the needle — Systematic review of candidate routes for non-injectable naloxone for opioid overdose reversal. Drug & Alcohol Dependence. 2016;163:16–23. Chou R, Korthuis PT, McCarty D, Coffin PO, Griffin JC, Davis-O’Reilly C, et al. Management of suspected opioid overdose with naloxone in out-of-hospital settings: A systematic review. Annals of Internal Medicine. 2017;167(12):867–75. Barton ED, Colwell CB, Wolfe T, Fosnocht D, Gravitz C, Bryan T, et al. Efficacy of intranasal naloxone as a needleless alternative for treatment of opioid overdose in the prehospital setting. Journal of Emergency Medicine. 2005;29(3):265–71. Belz D, Lieb J, Rea T, Eisenberg MS. Naloxone use in a tiered-response emergency medical services system. Prehospital Emergency Care. 2006;10(4):468–71. Kelly AM, Kerr D, Dietze P, Patrick I, Walker T, Koutsogiannis Z. Randomised trial of intranasal versus intramuscular naloxone in prehospital treatment for suspected opioid overdose. Medical Journal of Australia. 2005;182(1):24–7. Kerr D, Kelly AM, Dietze P, Jolley D, Barger B. Randomized controlled trial comparing the effectiveness and safety of intranasal and intramuscular naloxone for the treatment of suspected heroin overdose. Addiction. 2009;104(12):2067–74. Merlin MA, Saybolt M, Kapitanyan R, Alter SM, Jeges J, Liu J, et al. Intranasal naloxone delivery is an alternative to intravenous naloxone for opioid overdoses. American Journal of Emergency Medicine. 2010;28(3):296–303. Robertson TM, Hendey GW, Stroh G, Shalit M. Intranasal naloxone is a viable alternative to intravenous naloxone for prehospital narcotic overdose. Prehospital Emergency Care. 2009;13(4):512–5. Weber JM, Tataris KL, Hoffman JD, Aks SE, Mycyk MB. Can nebulized naloxone be used safely and effectively by emergency medical services for suspected opioid overdose? Prehospital Emergency Care. 2012;16(2):289–92. Sabzghabaee AM, Eizadi-Mood N, Yaraghi A, Zandifar S. Naloxone therapy in opioid overdose patients: Intranasal or intravenous? A randomized clinical trial. Archives of Medical Science. 2014;10(2):309–14. Doe-Simkins M, Walley AY, Epstein A, Moyer P. Saved by the nose: Bystander-administered intranasal naloxone hydrochloride for opioid overdose. American Journal of Public Health. 2009;99(5):788–91. Dwyer K, Walley AY, Langlois BK, Mitchell PM, Nelson KP, Cromwell J, et al. Opioid education and nasal naloxone rescue kits in the emergency department. The Western Journal of Emergency Medicine. 2015;16(3):381–4. Walley AY, Doe-Simkins M, Quinn E, Pierce C, Xuan Z, Ozonoff A. Opioid overdose prevention with intranasal naloxone among people who take methadone. Journal of Substance Abuse Treatment. 2013;44(2):241–7. Walley AY, Xuan Z, Hackman HH, Quinn E, Doe-Simkins M, Sorensen-Alawad A, et al. Opioid overdose rates and implementation of overdose education and nasal naloxone distribution in Massachusetts: Interrupted time series analysis. BMJ. 2013;346:f174. Rando J, Broering D, Olson JE, Marco C, Evans SB. Intranasal naloxone administration by police first responders is associated with decreased opioid overdose deaths. American Journal of Emergency Medicine. 2015;33(9):1201–4. Dowling J, Isbister GK, Kirkpatrick CM, Naidoo D, Graudins A. Population pharmacokinetics of intravenous, intramuscular, and intranasal naloxone in human volunteers. Therapeutic Drug Monitoring. 2008;30(4):490–6. McDonald R, Danielsson Glende O, Dale O, Strang J. International patent applications for non-injectable naloxone for opioid overdose reversal: Exploratory search and retrieve analysis of the PatentScope database. Drug & Alcohol Review. 2018;37(2):205–15. Lewis CR, Vo HT, Fishman M. Intranasal naloxone and related strategies for opioid overdose intervention by nonmedical personnel: A review. Substance Abuse & Rehabilitation. 2017;8:79–95. ADAPT Pharma Canada Ltd. NARCAN™ Nasal Spray. Available from: https://www.narcannasalspray.ca/en. 2017. Adapt Pharma Inc. NARCAN® Nasal Spray — Prescribing information. Available from: https://www.narcan.com/pdf/NARCAN-Prescribing-Information.pdf. 2017. Adapt Pharma Inc. The History of NARCAN® (naloxone HCl) Nasal Spray 4mg. Available from: https://www.narcan.com/pdf/NARCAN-Timeline.pdf. 2017. Peprah K, Frey N, Canadian Agency for Drugs and Technologies in Health (CADTH). Intranasal and intramuscular naloxone for opioid overdose in the pre-hospital setting: A review of comparative clinical and cost-effectiveness, and guidelines. Available from: https://www.ncbi.nlm.nih.gov/pubmedhealth/PMH0097397/pdf/PubMedHealth_PMH0097397.pdf. 2017. Elzey MJ, Fudin J, Edwards ES. Take-home naloxone treatment for opioid emergencies: A comparison of routes of administration and associated delivery systems. Expert Opinion on Drug Delivery. 2017;14(9):1045–58. Morrone WR. President’s message: Food and Drug Administration approved naloxone and continued use of improvised nasal naloxone: What is a treatment advocate and educator to do? Journal of Addictive Diseases. 2016;35(4):339–45. CBC. Spike in opioid deaths prompts Ontario government to offer free naloxone spray. March 8, 2018. Available from: http://www.cbc.ca/news/canada/windsor/ontario-opiod-death-spike-free-nalaxone-1.4567224. 2018. McDonald R, Lorch U, Woodward J, Bosse B, Dooner H, Mundin G, et al. Pharmacokinetics of concentrated naloxone nasal spray for opioid overdose reversal: Phase I healthy volunteer study. Addiction. 2018;113(3):484–93. Tylleskar I, Skulberg AK, Nilsen T, Skarra S, Jansook P, Dale O. Pharmacokinetics of a new, nasal formulation of naloxone. European Journal of Clinical Pharmacology. 2017;73(5):555–62. Avetian GK, Fiuty P, Mazzella S, Koppa D, Heye V, Hebbar P. Use of naloxone nasal spray 4mg in the community setting: A survey of use by community organizations. Current Medical Research & Opinion. 2018;34(4):573–6. Wermeling DP. A response to the opioid overdose epidemic: Naloxone nasal spray. Drug Delivery & Translational Research. 2013;3(1):63–74. Weiner SG, Joyce AR, Thomson HN. The prevalence of nasal obstruction as a consideration in the treatment of opioid overdose. Journal of Opioid Management. 2017;13(2):69–76. Roan JP, Bajaj N, Davis FA, Kandinata N. Opioids and chest wall rigidity during mechanical ventilation. Annals of Internal Medicine. 2018;09:09. Phua CK, Wee A, Lim A, Abisheganaden J, Verma A. Fentanyl-induced chest wall rigidity syndrome in a routine bronchoscopy. Respiratory Medicine Case Reports. 2017;20:205–7. Burns G, DeRienz RT, Baker DD, Casavant M, Spiller HA. Could chest wall rigidity be a factor in rapid death from illicit fentanyl abuse? Clinical Toxicology. 2016;54(5):420–3. Dimitriou V, Zogogiannis I, Liotiri D, Wambi F, Tawfeeq N, Koumi A, et al. Impossible mask ventilation after an unusually low dose fentanyl-induced muscle rigidity in a patient with essential tremor: A case report and review of the literature. Middle East Journal of Anaesthesiology. 2014;22(6):619–22. Coruh B, Tonelli MR, Park DR. Fentanyl-induced chest wall rigidity. Chest. 2013;143(4):1145–6. Rapid Response Service. NARCAN® Nasal Spray. Toronto, ON: Ontario HIV Treatment Network; May, 2018.